I remember eating kulfi during the summer holidays growing up. 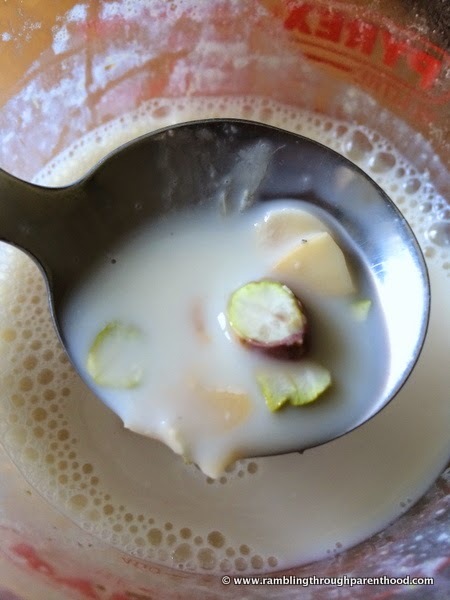 My Aai (Mother) used to make the most amazing kulfi ever. Kulfi, by the way, is a milk-based ice-lolly, extremely popular in India and the sub-continent. It is traditionally made by slowly evaporating sweetened and flavoured milk, which is subsequently cooled and frozen. I want my little boy J to grow up with a diverse and multi-cultural palate. And to enjoy his Aaji's (Grandma's) recipes which I try and recreate. 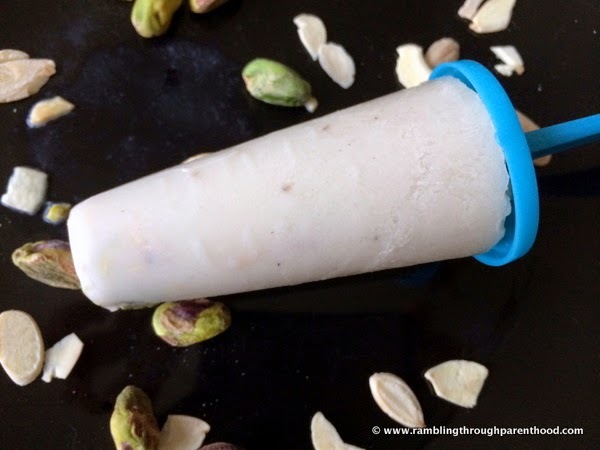 So when Center Parcs challenged us bloggers to get into the spirit of summer by creating delicious ice lollies, I contemplated making traditional kulfi. But it is quite calorific and rather dense. And although it goes down a treat in an Indian summer, I prefer something a little lighter in the scorching heat of the British summer. (Never in a million years did I dream I would be writing that. But, hey ho! The present heat-wave is making it feel more like Mumbai than Manchester). Back to my kulfi. I wanted the flavours sans the calories. I was spurred on by Deb Rogerson's tip: "Want to experiment with different flavours? Mix Greek yoghurt with a squeeze of honey, then just add your own additional flavouring. How about adding some crushed blackberries or blending banana in with the yoghurt? 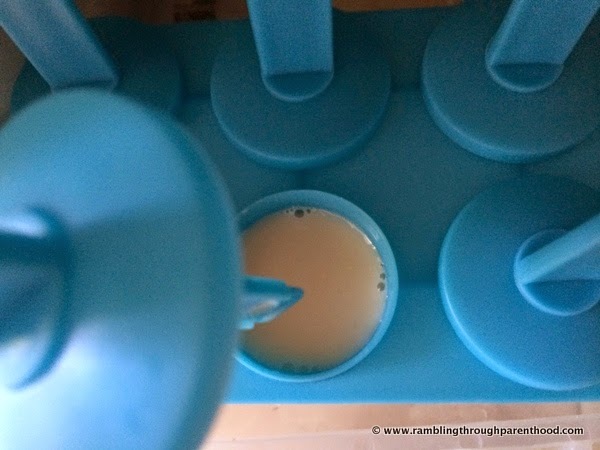 Transfer your mix to ice lolly moulds and set in the freezer." So I put on my inventor's hat and decided to make my kulfi with a twist. Full-fat milk was substituted with almond milk. And I used pieces of almonds and pistachios rather than artificial flavours or colours. Believe me, there was no compromise on taste. 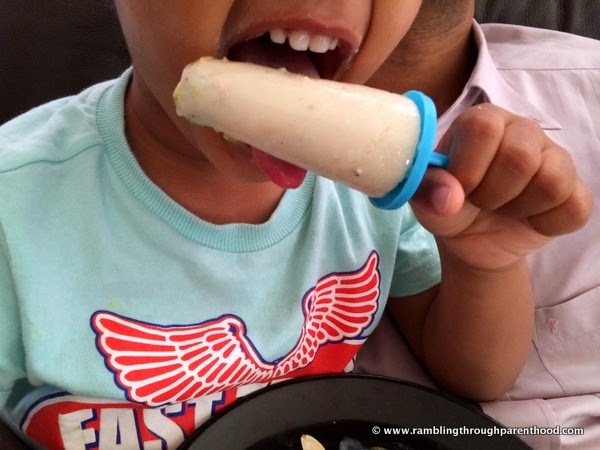 J will happily testify to that between mouthfuls of cold, sweet kulfi ice lollies. 1/2 tsp cardamom powder. About 3-4 medium-sized pods should do it. I prefer grinding them fresh to get the powder, rather than buying it prepared. Smells much better that way. Place the flaked almonds and pistachios in a microwaveable container. Add 100 mls of almond milk and cook on high power at 800 watts for about 3 minutes or until the nuts have softened. Stir intermittently to prevent the milk from boiling over. Allow the mixture to cool down to room temperature. 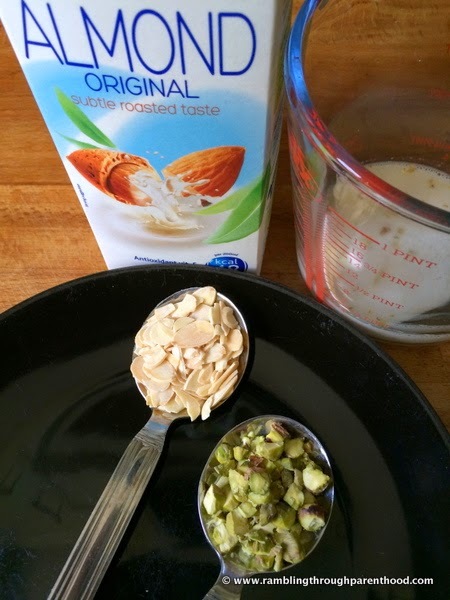 Now add the remaining almond milk and the cardamom powder and stir to ensure uniform mixing. Divide the flavoured mixture equally into the ice-lolly moulds. We used some cone-shaped plastic ones. You can use any shapes you want. Try little earthenware pots or conical metal moulds to give it a more authentic kulfi feel. I really need to source these for future use. The mould doesn't matter. The end-result does. 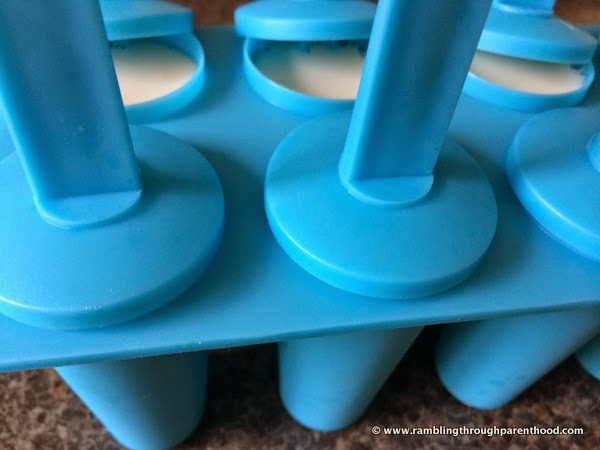 So pop the filled moulds into the freezer to allow the ice lollies to set. Now for the difficult bit. Wait patiently while the almond and pistachio kulfi sets. Resist the temptation to open the freezer and check on their progress every few minutes. After about 4-5 hours, the kulfi ices should be ready to eat. Ease them out of the mould and tuck in. The flavours of the sub-continent will be yours to cherish. All in the middle of the British summer. This is my entry to the Center Parcs and Tots100 July challenge. If I’m chosen, I would like to visit Sherwood Forest. What a great idea. These look really lovely and healthy too. Oh my, they look great. I adore pistachios and bet these taste fantastic. these sound lovely - perfect for this hot weather! These look like a lovely idea and not ones that I've seen before! 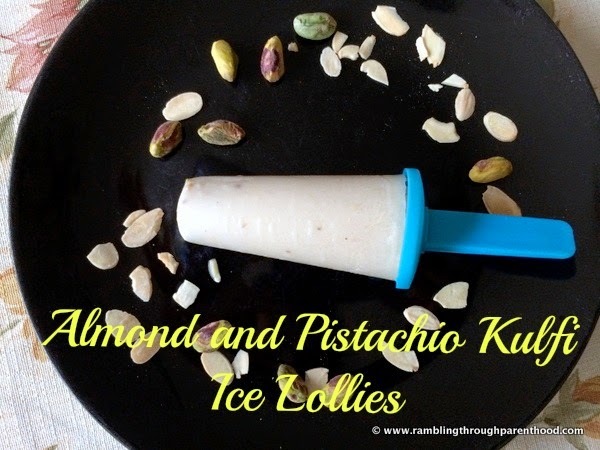 I actually didn't know you could make kulfi with almond milk. That's good news for us.